Galvanizing. Life Changing. Inspiring. Metamorphic. Vitalizing. Focusing. 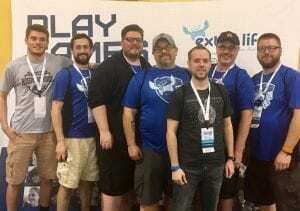 Those are just some of the words that our seven Extra Life gamers used to describe their experience at Extra Life United 2019. The incredible seven won a collective $2,225 to benefit BBCH (woot! )… but headed home with so much more than that. Ryan got to meet a friend- IRL for the first time- who he had been gaming with with for a couple years. Rob and Justin connected with friends they’d met at past ELU’s who live all across the US and Canada. Jamison was invited to speak on a panel and share best practices for fundraising through table top gaming. And we all got to play games with new friends and get inspired by the CMN Champions and their families. Despite our best efforts, Extra Life United is still hard to put into words. Please check out this highlight video, or chat with one of these guys the next time you see them at a local Extra Life event… we hope that you’ll consider joining us at Extra Life United 2020- it’s so much more than just a tournament!